SD Dirk photo. The pitcher above, Madison Bumgarner, is doing a pretty good impression of the pitcher below, Christy Mathewson. 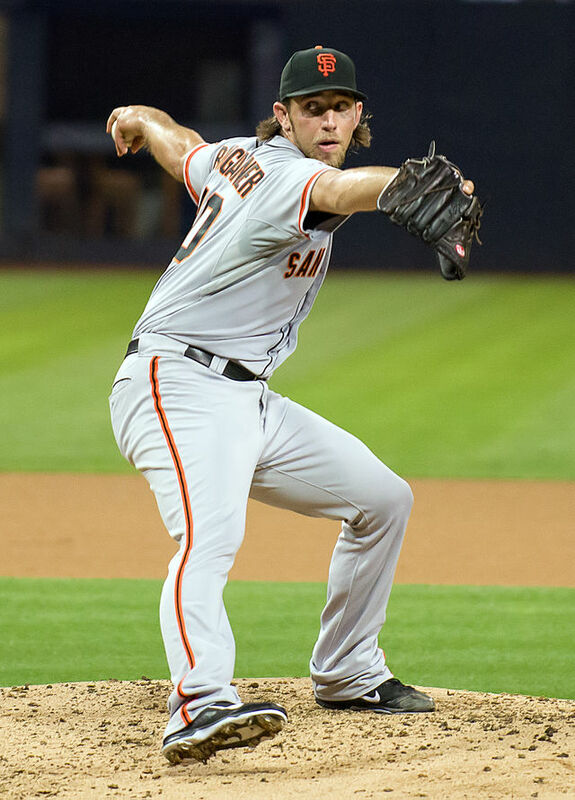 Madison Bumgarner’s fastball is as hot as a bottle of top-shelf chili sauce. Royals’ batters flailed away at the lefty’s four-seamers and cutters for nine innings Sunday night in Game 5 of the World Series. They did the same thing in Game 1. OK, Kansas City did manage to score one measly run off the Giants’ ace in the first game before being shutout in the fifth. Bumgarner’s Series ERA stands at a teeny-tiny 0.56. He may not be done, either. He could pitch at least a few innings if the Series goes seven games. Bumgarner said in a post-game interview that he’ll be ready if needed. The only thing scarier for Kansas City might be a tornado. So, Bumgarner will likely go down as the Giants’ second-best World Series pitcher of all-time. You need to look back more than a century to find a better one. 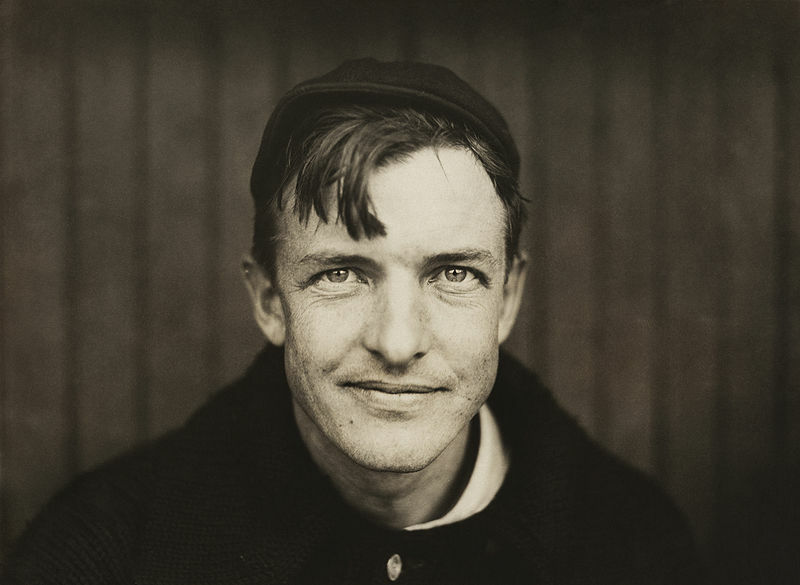 The great Christy Mathewson pitched three-complete game victories for the New York Giants in the 1905 World Series against the Philadelphia A’s. His Series ERA was 0.00, and you can’t get any better than that. Mathewson, the so-called “Christian Gentleman,” threw fastballs and fadeaways (now called “screwballs”) well enough to win 373 games in his 17-year career. In 1905, the right-hander went 31-9 with a 1.28 ERA (ERA+ 230) and 206 strikeouts in the regular season. Matty pitched in the 1905 World Series as a 25-year-old, the same age that Baumgarner is now. He gave up four hits and struck out six in Game 1 of the Series, Oct. 9 at Baker Bowl in Philadelphia. Always a control artist, he didn’t walk a batter. The Giants beat the A’s 3-0. You couldn’t pitch any better in the World Series than Christy Mathewson did in 1905 for the New York Giants. Following a 3-0 A’s win in Game 2 at the Polo Grounds, the Series returned to Baker Bowl on Oct. 12. Mathewson gave up four hits again and struck out eight in Game 3. He walked a lone batter, and the Giants won 9-0. Dan McGann, one of New York manager John McGraw’s favorite drinking buddies, enjoyed a big game. The Giants’ first baseman went 3-5 with four RBI. The next day, New York took a commanding 3-1 lead in the best-of-seven Fall Classic. Joe McGinty, who would pitch professionally until he was 54 years old, outdid Eddie Plank 1-0. That left Mathewson to pitch the potential clincher on Oct. 14, and the Christian Gentleman came through again. He struck out four, gave up six hits and did not walk anyone. The Giants narrowly beat future Hall of Famer Charles “Chief” Bender 2-0.